A Newton Aycliffe business has secured more than a million pounds’ worth of investment from a major private equity firm. 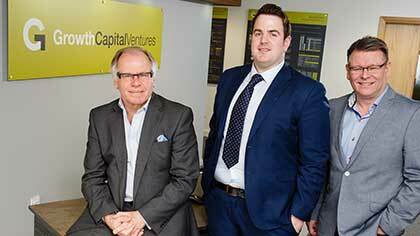 Growth Capital Ventures (GCV) has received a £1.1m boost from Maven Capital Partners, a prominent UK private equity house, and worked alongside another local business, Stockton-based Endeavour Partnership, to complete the deal. GCV is a leading developer and operator of online co-investment platforms. Their first platform, GrowthFunders, allows everyday investors to invest alongside professional investors and venture capital funds, backing the next generation of high growth British businesses. Co-founder Craig Peterson said: “We’ve worked closely with Endeavour for the last few years. The team have advised on a number of key areas as our business has grown. In addition, GCV now also plans to launch a new ‘Peer to Peer’ (P2P) lending platform that will allow investors to invest in asset backed property and clean energy opportunities. Endeavour Partnership advised GCV on various legal aspects of the investment. Martin McKinnell, associate at Endeavour Partnership, said: “This was a detailed and fast-moving deal with varying aspects. “We advised on a number of elements including due diligence enquiries raised by Maven, reviewing and amending transactional documents with regards to the investment, overseeing the investment process and dealing with the administrative aspects of implementing the investment both in terms of pre-completion changes to GCV and implementation of the investment structure. “It was an interesting deal for Endeavour Partnership, not only because it’s a fantastic achievement for another local business, but also because we teamed up with Maven, a prominent private equity firm, to complete the deal”. Peterson added: “GVC is expanding nationally but we remain committed to our heartland region of the North East. “To have a business-focussed law firm based locally, with the breadth of expertise we needed on this deal, gave us confidence to complete the deal efficiently”. Endeavour Partnership employs a team of 50 and has a reputation spanning over 16 years, providing high quality advice on a range of business law matters including mergers and acquisitions, intellectual property, employment, commercial property and corporate recovery and insolvency from its headquarters at Teesdale in Stockton.